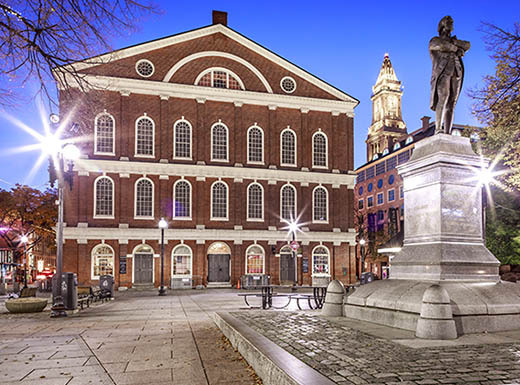 After a full day of walking the Freedom Trail, exploring Old City Hall, and seeing the sights at Boston Common, you’re bound to get hungry for some hearty New England fare. 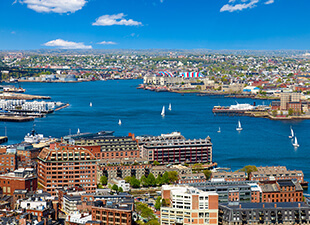 After a full day of walking the Freedom Trail, exploring Old City Hall, and seeing the sights at Boston Common, you’re bound to get hungry for some hearty New England fare. 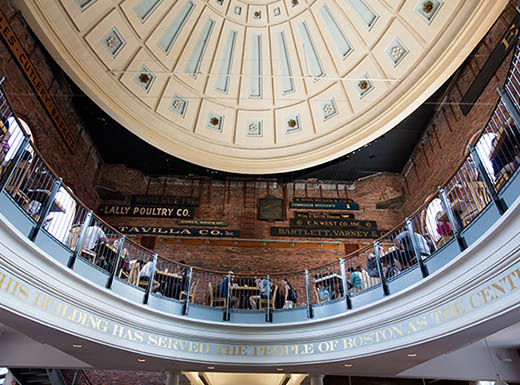 When the craving hits for some down-home New England delights, head to Faneuil Hall Marketplace, founded way back in 1742. Located in the middle of north and south Market Street near the waterfront, the market contains 18 restaurants and pubs, 35 colonnade eateries, and 44 pushcarts. Needless to say, you have your pick of favorite foods on every visit. Located in one of Faneuil Hall’s four main buildings, Quincy Market is one of Boston’s most popular food destinations. The offerings cover just about anything you could have a hankering for — Chinese, Thai, seafood, burgers, or even an oversized scoop of ice cream. Boston institution since 1827, Durgin-Park serves up classic New England fare and comfort food. If you want a warm bowl of clam chowder on a chilly afternoon, this is the place to get it. The extensive seafood menu includes clams, oysters, and sea scallops along with an ocean of classic fish dishes. If your favorite foods don’t swim, dig in to mainstays like pork chops, steak, chicken pot pie, and crocks of Boston baked beans. Jen Lai Rice and Noodle Co.
For a quick lunch, check out one of Quincy Hall’s many food stalls to find everything from Indian fare to Mexican favorites and sushi. Jen Lai Rice and Noodle Co. serves generous portions of tasty Asian cuisine quickly and with a friendly smile. Entrees include sweet and sour, sesame, and teriyaki meat dishes as well as traditional appetizers like egg rolls and hot and sour soup. First, the name is cool. Second, the seafood is yummy. You can’t go wrong with fresh oysters, Maine lobster dishes, and fried specialties. For a happy hour indulgence, head to the raw bar, and order a half-dozen oysters. Located in Quincy Market’s south canopy, the Salty Dog is a Faneuil Hall landmark for tasty seafood in a casual atmosphere. This Irish pub is a favorite dining spot for locals and visitors alike. The menu features standard pub fare, including classic fish and chips and Guinness beef stew, but the regulars show up time after time for the pastrami sliders. These delights include three fluffy potato rolls, toasted and stuffed with generous portions of black pastrami, grilled onions, melted Swiss cheese, and Guinness mustard. Yum! You can find the only Wicked Good Cupcakes retail spot in Quincy Hall’s center rotunda. Dig in to its signature dessert — two cupcakes, frosting, and toppings in an eight-ounce jar —for the ultimate sugar buzz. Choose from Sea Salted Caramel, Vanilla, Gimme S’more, and other heavenly combinations. Wheat allergy? No problem! Stick to one of the gluten-free options. Boston is a fun — and delicious — city, and the quick and convenient offerings at Quincy Market are only the tip of the iceberg. Pick up other great tips and ideas on Facebook. Planning a quick trip to Boston? There’s a lot of cool stuff to do and see while you’re in town. Here’s a 72-hour guide to point you in the right direction. 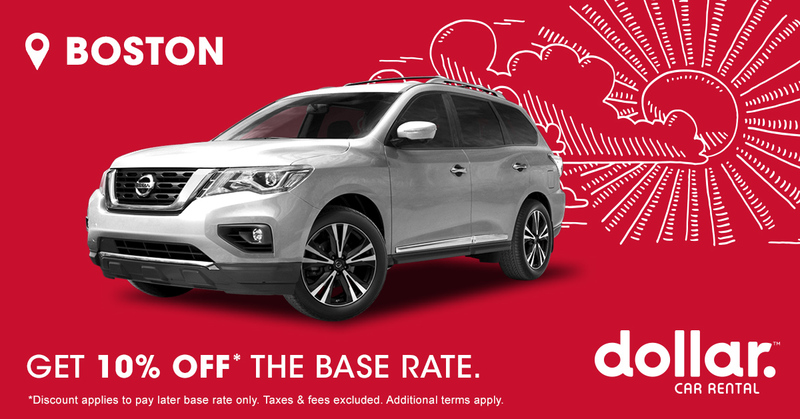 Taking the family to Boston for a getaway? 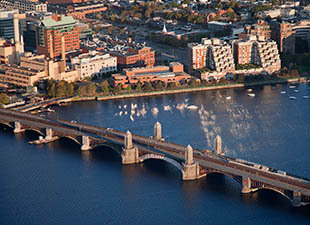 Check out these low-cost stops to make the most of your next Bean Town family vacation. 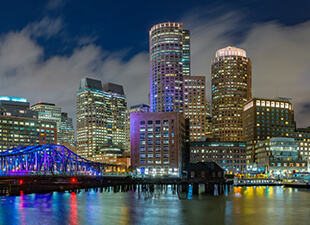 Anyone who has visited Boston knows to stroll through Harvard Yard, glimpse American history along the Freedom Trail, take in a Red Sox game, and spend an afternoon in the Museum of Fine Arts or Isabella Stewart Gardner Museum. © 2019 DTG Operations, Inc. All rights reserved.